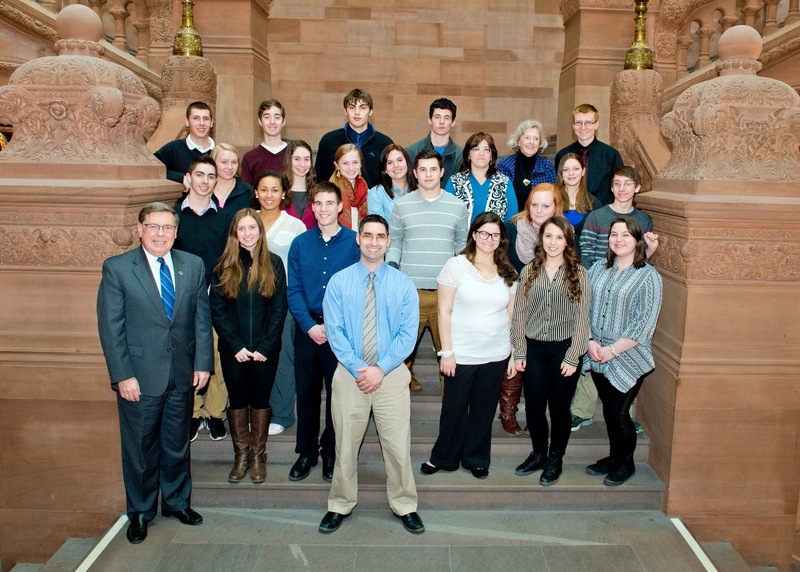 ALBANY, 03/24/15 – State Senator James L. Seward (R/C/I-Oneonta) and Assemblyman Pete Lopez (R/C/I-Schoharie) today welcomed students with the Schoharie County 4-H legislative intern program to Albany. 4-H legislative intern program on the “Million Dollar” Staircase. High school seniors from Cobleskill-Richmondville, Gilboa-Conesville, Middleburgh, Schoharie, and Sharon Springs toured the state Capitol learning about state history and observing the inner workings of state government. Students in the legislative intern program meet monthly to learn about county and state government through hands-on experiences like the Albany tour. Several alumni of the program have gone on to successful careers in the public sector. “Public service is vital to the future growth and success of our local communities. I look forward to seeing these students go on to serve in the public arena as elected officials, volunteers, or in other public posts,” Seward concluded.